If the goals are reached, Tesla will be one of the biggest companies in America, and Musk's wealth would grow exponentially. 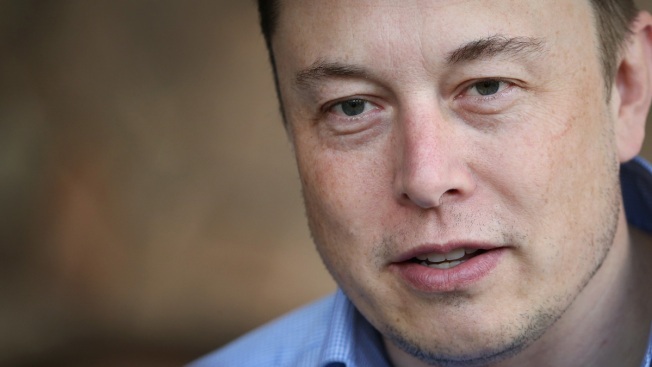 In this July 7, 2015 file photo, Elon Musk, CEO and CTO of SpaceX, CEO and product architect of Tesla Motors, and chairman of SolarCity, attends the Allen & Company Sun Valley Conference in Sun Valley, Idaho. Elon Musk will remain at Tesla under a 10-year, all-or-nothing pay package that demands massive growth. The agreement, revealed Tuesday in a regulatory filing, requires that Tesla grow in $50 billion leaps, to a staggering $650 billion market capitalization. To put those demands in perspective, the electric car maker, based in Palo Alto, California, is worth less than $60 billion today. Tesla must hit a series of escalating revenue and adjusted profit targets, only after which Musk would vest stock options worth 1 percent of company shares. He would get no other guaranteed compensation including salary, bonuses or equity "that vests simply by the passage of time," Tesla said. If the goals are reached, Tesla will be one of the biggest companies in America, and Musk's wealth would grow exponentially. If the company reaches the $650 billion benchmark, Tesla would be the fourth-most valuable U.S. company, behind only Apple Inc., Alphabet Inc., and Amazon.com Inc. based on current valuations. It would be larger than and Microsoft Corp., and would exceed the current combined valuation of the world's top eight publicly-traded auto companies. In order to vest shares when milestones are reached, Musk must stay on as CEO or serve as both executive chairman and chief product officer. Tesla provides for Musk's long-term leadership, but also gives flexibility to name another CEO in the future. Tesla said while it doesn't currently intend for Musk to step away from the CEO role, the terms allow Musk to potentially focus more of his attention on key product and strategic matters in the future. Musk has worked under similar all-or-nothing conditions before. Under a 2012 agreement, Musk's stock options that vested only if the Tesla's market cap continued to rise in $4 billion increments. The company also had to hit matching operational milestones, including vehicle production targets and developmental milestones tied to the Model X and Model 3 programs. Tesla wound up reaching all of the market cap milestones and nine of the 10 operational milestones. When that pay package was created, the company was worth a fraction of what it is worth now, and the goals have become more highflying. While Musk continues to generate with SpaceX program and hyperloop mass transit systems, Tesla has had some difficulty meeting production targets. The company fell short of production goals for its new Model 3 sedan this month. Tesla made 2,425 Model 3s in the fourth quarter. That's only a fraction of the 20,000 per month that Musk promised last summer when the car first went into production. Tesla has wrestled with production bottlenecks and now expects to produce 10,000 Model 3s per month at the end of the first quarter, and 20,000 Model 3s per month at the end of the second quarter. But the company, while recording ascending sales numbers, continues to lose money. Musk's new pay package still needs the approval of Tesla shareholders, who will vote on it at a special meeting in late March. Elon and Kimbal Musk, Elon's brother, will recuse themselves from the vote.